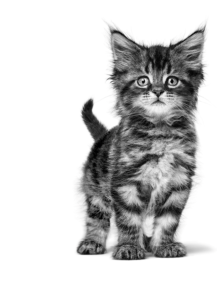 Home » Articles » When Can Kittens Eat Cat Food? Whether you have a brand new kitten, or if your kitten is getting a little older, you want to make sure you’re feeding them the right food. In this article, we’ll look at a kittens different life stages from a nutritional perspective and what you can do to give it the right kinds of food. From the point where kittens are weaned, starting at four weeks old, they will need to start moving onto solid food. Generally they will be consuming all solid food by the time they are seven weeks old. We would strongly advise against this. The digestive system of a kitten is still immature, meaning that it isn’t ready to process the same kind of food that an adult cat will have. Due to their digestive development, they are very susceptible to upset stomachs. That’s why we make an ultra-digestible food, specially formulated for kittens. This also includes a tailor-made kibble, which has a shape and size to help kittens to chew and swallow their food. This food also supports kittens’ natural defences – between 4 to 12 week old kittens are particularly vulnerable to diseases and infections, so this is especially important. When should I move my kitten on to adult cat food? Our adult cat food is designed to be eaten from when your cat is 1 year old, up until the age of 7. We hope this answered your questions on what kittens can eat and when. However, if you’d like to know more about kittens, nutrition and cat health in general, then sign up for our newsletter below to receive more helpful information.